Hooters of America, headquartered in Atlanta, Georgia, is a global franchise with more than 420 locations in 44 states and 29 countries. A leader in the franchise model, they get approximately 4 million visitors a month. They are committed to being a place where employees can have a professional experience that allows them to learn and grow and where guests can enjoy great food in a fun environment. Before investing in an LMS to deliver training, Hooters relied on field training driven by hourly team members. There was a lot of inconsistency in the content and quality of training, and it was also difficult to track whether training was done correctly. Hooters needed an LMS that could electronically deliver materials and training, while gathering e-signatures to prove training completion and compliance. Before investing in an LMS to deliver training, Hooters relied on field training driven by hourly team members. This meant there was a lot of inconsistency in the content and quality of training. It’s also difficult in a company of this size to track whether training was done correctly. In addition to conducting in-person training, Hooters also used paper-based training manuals, which had to be purchased by franchisees and delivered to the locations. Since creating a high-quality manual involved ordering them from the printer in bulk, it made it difficult and expensive to update the training on a regular basis. Policy updates were all done on paper, so it took time to distribute materials to all locations and obtain employee signatures. Because of this, Hooters began looking for an LMS that could replace their outdated paper-based system with a way to securely distribute materials that required an employee signature. This new system also had to deliver consistent training. Most importantly, it had to have high personalization options so that franchisees could adapt it to the needs of their location. Hooters had never heard of eLogicLearning prior to looking for an LMS and, in fact, they didn’t learn about eLogicuntil they were about to sign a contract with another LMS. A new executive stopped the contract signing and insisted Hooters look at eLogic’seSSentialLMS first. The new executive had worked with eLogicbefore and knew the company had a great team and an unparalleled partnership approach. The training team loved that eLogichad all the features they needed and the room to grow into their future needs. eSSential has a very detailed hierarchy that can tag users with different roles, locations, statuses, and more. This makes it easy to automatically assign courses to thousands of employees based on those factors. It saves time and it also ensures that no employees are overlooked in a busy restaurant environment. 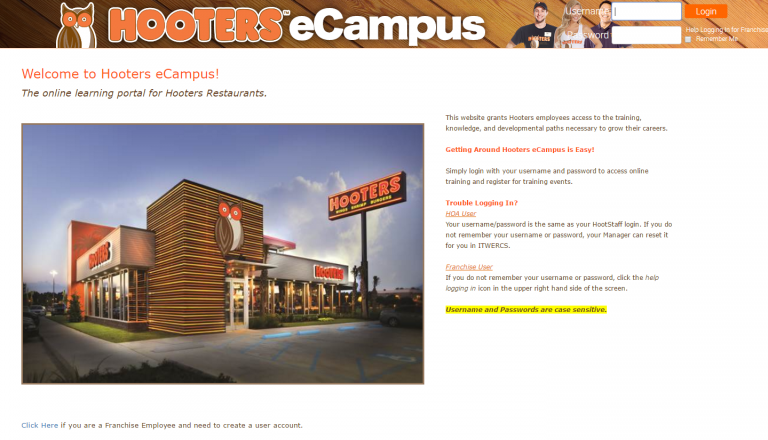 Hooters uses eSSential LMS to automatically assign courses to employees based on their role and geographical location. When the restaurants rolled out new cleaning chemicals, they were able to assign training a week before the chemicals were changed out at each store so that every employee received the training at exactly the right time. Franchises are especially vulnerable to disputes of accountability. Use of a secure system like e-signature ties up any legal loose ends in regards to employee responsibly. The proof is there that the employee got the memo, took the training, or whichever situation is relevant –via e-signature. Hooters uses e-signatures in many different situations. For example, an e-signature was required upon completion of a sexual harassment course. They were able to assign the course out to the entire company in thirty minutes and obtain all necessary signatures in less than a month. One of the most effective ways to keep employees on top of their game is to reinforce knowledge through recurrent training, along with reminders of some of the most important bits of training that staff need at the forefront of their mind. Recurrent training is difficult and expensive to do via a paper-based system –it takes a long time to develop and deliver, so new training or updates happens infrequently. Online training addresses this issue by making it quick to develop and distribute training. For Hooters, they were able to replace a quarterly training packet – which took months to build and send out – with monthly online safety topics, accompanied by responsible alcohol service tips and a knowledge comprehension quiz. Hooters has been better able to preserve brand integrity, while also personalizing training based on the needs of every location, and every employee. Franchisees were quick to adopt the new training model, with the overall number of participating franchisees increasing. Smaller franchisees especially appreciated Hooters’ move from the more expensive, inefficient paper handbooks to a modern online method of training. Their insurance company also appreciated the more frequent safety training and gave the company an insurance premium break of $500,000. This alone created a huge return on investment for Hooters, besides the additional time and money saved from more streamlined processes.